There are hyperlinks on this page to a more detailed description of our book, the author, and ordering information. The ordering link connects to the US website of Amazon. It is also possible to order the book through other book sellers, including country-specific branches of Amazon such as amazon.co.jp, and the usual book wholesalers that support volume sales. By the way, the listings on the Download page have links to the same pages. In the Downloads table, the book title is linked to details on the book, and the ISBN number is linked to the ordering page. 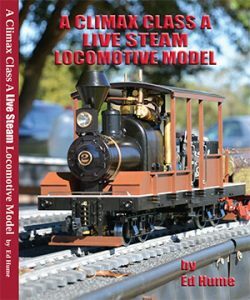 The cover shows the author’s locomotive model pulling a log train at Zube Park in Houston Texas.